Hurricane Daniel was threatening to ruin racing for the day however, the trade winds disappeared and the visibility decreased with the rain as a result the one race was shortened. The water was relatively flat with long period swell waves of about 1m high. One Tiburon (SFYC) came out to play they had difficulties making their North main work in the light air (under 7 knots all day). Our sails are new Quantums built in Annapolis loft and were easy to trim for the conditions. Rebuild and calibrate Nexus instruments which wouldn’t calibrate for a number of reasons including position of gyro compasses. Hoisting the boat out to grind down the thinly rolled on antifoul as it felt like 60 grit sandpaper. Sanding the bottom to 330 grit wet and dry took 2 days. As our crew were a total of 44 lbs overweight I ate nothing except slim fast shaves and managed to lose 16lbs during the week before weigh in. We were 22 lbs under class weight after everyone had weighed in. A pair of Kenwood Cup bound J105’s – Jose Cuervo and Irrational Again had an excellent adventure. After two boats failed to roll off the container ship in Honolulu last Wednesday (oops! someone left them in a back corner of the Matson yard in Oakland), things look pretty bleak for the two boat’s chances of participating in the already small (30 boats) Kenwood Cup, which began on August 1. After almost a year of planning and wo knows how many dollars, the skippers and crews of both 105s were devasted. The four J105’s remaining in the Kenwood Cup weren’t exactly thrilled either, as they were now faced with losing their one design start. After a bunch of presumably heated phone calls (and the threat of a rather large lawsuit) Matson – to their everlasting credit – quicly came up with an alternative arrangement. 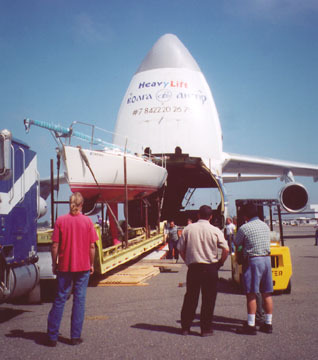 For something like $225,000, they contacted HeavyLift Cargo Airlines and chartered a gigantic Russian-built Antonov AN-124 plane – one of just three in the world – to ”airmail” the two boats to Hawaii. Jose and Irrational were the only cargo, hardly denting the plane’s 120 ton carrying capacity. The only people on board were 16 Russians (9 pilots and 7 crew), an English representative from HeavyLift, and two local J105 sailors (Jose crew Erik Schumann, who was meant to accompany the delinquent sisterships, and a spur of the moment ”stowaway, Karen Rosenbaum). The story ends happily, with the two boats arriving safely in Hawaii and being resembled in time for the regatta. Kind of gives a whole new meaning to the expression ‘planing to Hawaii, doesn’t it?